Estheticians often tell me that if they had to send their clients home with only ONE retail product to maintain beautiful, glowing skin, it would be an exfoliator. Something gentle, but powerfully effective in sweeping away dead skin cells, brightening dull complexions and keeping skin clear of breakouts, thus keeping clients' skin looking great in between facial appointments. This is important for both the client and the esthetican because great product recommendations build trust and repeat business. Years ago, my esthetican sold me Dermalogica's Daily Microfoliant after a facial: A dry, powder exfoliating polish that activates with water. I LOVED it devotedly for a few years. I have subsequently tried BareMinerals / Bare Escentuals - Exfoliating Treatment Cleanser and found it to be blah. 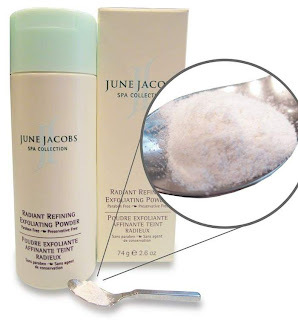 So when June Jacobs recently launched her Radiant Refining Exfoliating Powder, I was eager to try and compare. The results of June Jacob's Radiant Refining Exfoliating Powder.... IT IS MY NEW OBSESSION! My skin is not glowing - it is BEAMING. All the little hormonal pimples I had bulging at the surface of my skin have retreated. My skin looks smooth, healthy, flawless and RADIANT, and it looks YOUNG! Which, after just turning 40 last month, is very important!! June Jacob's is a world renowned name and brand in the five-star spa industry. Her products are highly regarded for their natural properties and effective performance. Estheticians and Day Spas - if you are looking for an exciting, effective, paraben free, dye free, fragrance free and sulfate free line of products to retail to your clients and to use during facials - check out June Jacobs wholesale at Pure Spa - call 800-434-0018 for your pricing! The above listed ingredients are in addition to MANY others! MICROCRYSTALLINE CELLULOSE, TALC, SODIUM COCOYL ISETHIONATE, DISODIUM LAURYL SULFOSUCCINATE, SODIUM LAUROYL GLUTAMATE, AVENA SATIVA (OAT) KERNEL FLOUR, BAMBUSA ARUNDINACEA (BAMBOO) STEM POWDER, ORYZA SATIVA (RICE) STARCH, ORYZA SATIVA (RICE) BRAN EXTRACT, WATER/AQUA/EAU, PCA, HYDROLYZED WHEAT PROTEIN, ALLANTOIN, PAPAIN, SALICYLIC ACID, PROPYLENE GLYCOL, GINKGO BILOBA LEAF EXTRACT, CAMELLIA OLEIFERA (GREEN TEA) LEAF EXTRACT, CAMELLIA SINENSIS (GREEN AND WHITE) LEAF EXTRACT, MELALEUCA ALTERNIFOLIA (TEA TREE) LEAF OIL, GLYCYRRHIZA GLABRA (LICORICE) ROOT EXTRACT, ARCTOSTAPHYLOS UVA URSI (BEARBERRY) LEAF EXTRACT, MORUS ALBA (MULBERRY) FRUIT EXTRACT, CITRUS MEDICA LIMONUM (LEMON) FRUIT EXTRACT, SALIX ALBA (WILLOW) BARK EXTRACT, LYCIUM BARBARUM (GOJI BERRY) FRUIT EXTRACT, LACTOBACILLUS/PUNICA GRANATUM (POMEGRANATE) FRUIT FERMENT EXTRACT, VITIS VINIFERA (GRAPE) SEED EXTRACT, ASPALATHUS LINEARIS (RED TEA) LEAF EXTRACT, TRIETHOXYCAPRYLYLSILANE, BUTYLENE GLYCOL, MALTITOL, MALTODEXTRIN, TITANIUM DIOXIDE (CI 77891). Wow -- I was a die hard Dermalogica user... I gotta get this and try it! you got me -- i'll try it.